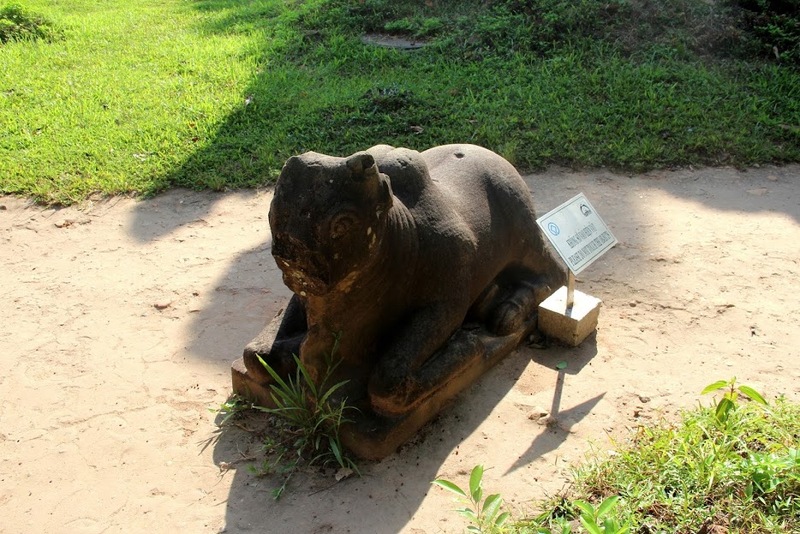 Pretty much unknown to us, the Champa Kingdom was one of the greatest Asian civilizations, ruling central and southern Vietnam from the 2nd to the 17th century. Hoi An was their commercial capital and My Son the spiritual one. 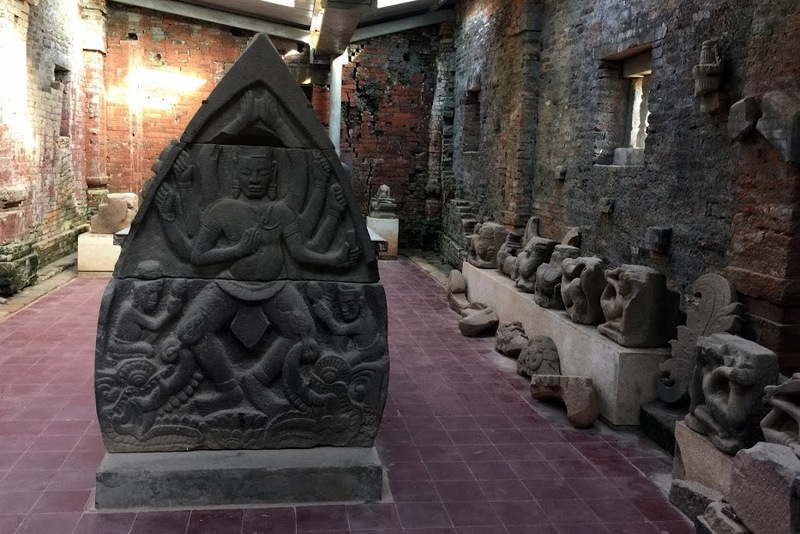 Dozens of Hindu temples were built at this location between the 4th and the 14th century, only to be reclaimed by the jungle when the empire fell under the Nguyen dynasty. 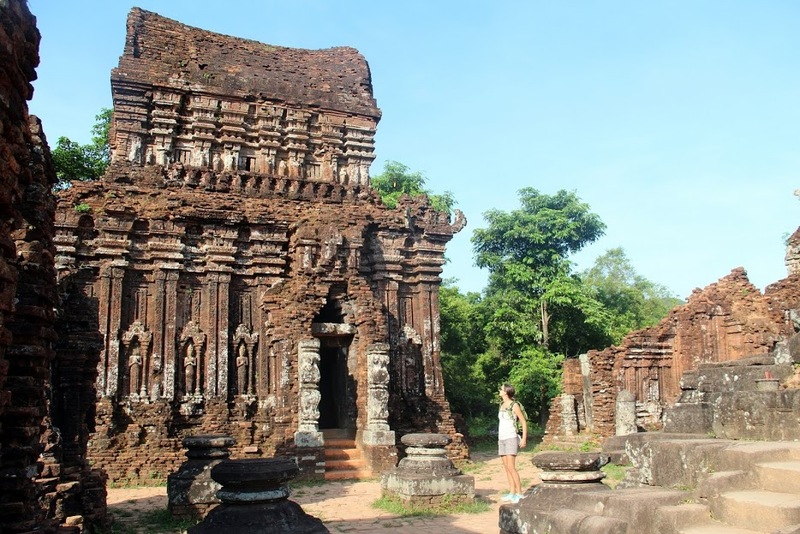 The archaeological site, designated with UNESCO World Heritage status, is located 35km south of Hoi An, and is a common half-day trip from there. We were very interested in visiting My Son, but as usual, we wanted to avoid the crowds and the tours that treat you like cattle. So after asking in many places, we arranged a private car: we would be picked up at 6:30am, before the tours began, and have the car for 5 hours, all for VND 50,000 (~$20). An alternative and much cheaper way to visit My Son is to rent motorbikes. But it is technically illegal to drive without a Vietnamese driver’s license, and we were still a bit shaken from our experience in Laos’ Plain of Jars… so we opted for the car. Our driver picked us up punctually, and 40 min later we pulled over at the ticket office (VND 100,000 or $4.5). We drove a bit further, and got out at the actual entrance to the sanctuary. It had opened just a few minutes earlier, and we gladly observed that there was absolutely no one else there yet. 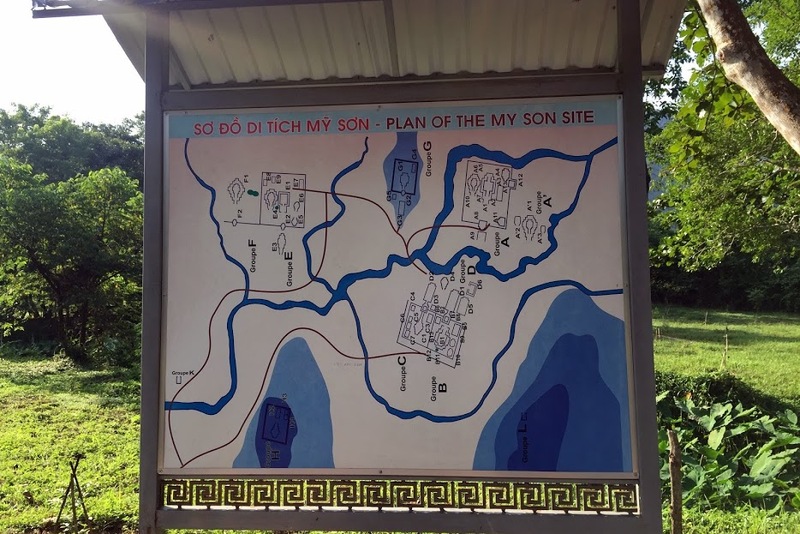 The ruins were grouped and labeled, and it was easy to navigate the main ones even without our own map. We walked right up to groups C and B, probably the most intact of all. 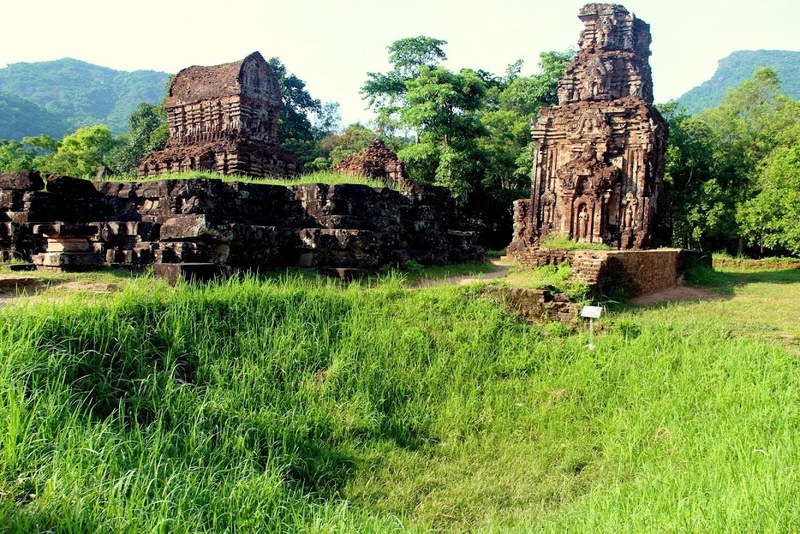 Throughout the site, the temples are in different states of restoration, having been destroyed not only by time and nature, but also by heavy bombing during the Vietnam/America War (see the crater in the picture above). The Viet Cong used My Son as a base, and the US Congress was eventually pushed to prohibit its bombing, due to its historical importance. 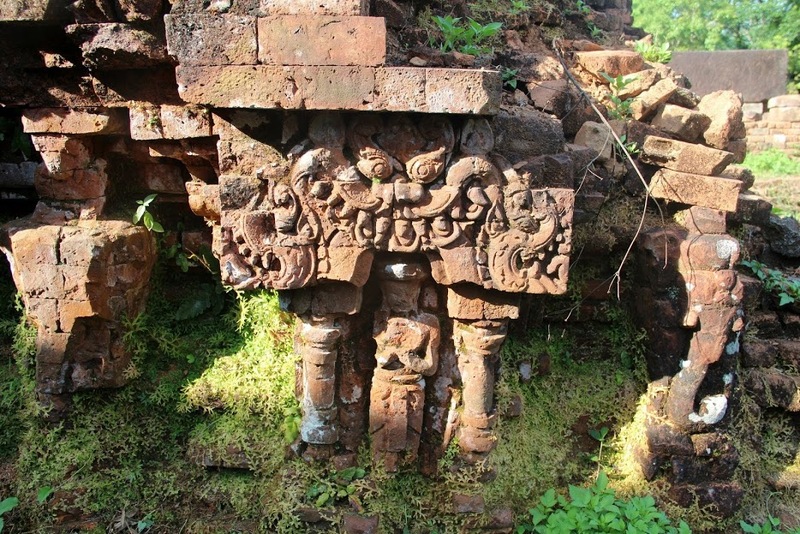 We walked around the different temples, most dedicated to Shiva, and admired their intricate brickwork. We continued on to group D, where it was possible to get into some of the buildings, containing original masonry and sculptures. In addition to the ruins, My Son stands out for its natural setting, in a jungle valley surrounded by lush hills. It’s easy to understand why the cham considered this location sacred. A bit further, we crossed the river and reached group A, which used to be the main one and was completely destructed by US attacks. Among the piles of bricks, we were able to find some amazing remains, like the carving of a Javanese sea-monster in a column. From there, we walked to group G, which was being fully reconstructed. Our favorite thing in this area were the large sculptures in front of the temples, especially the cow. 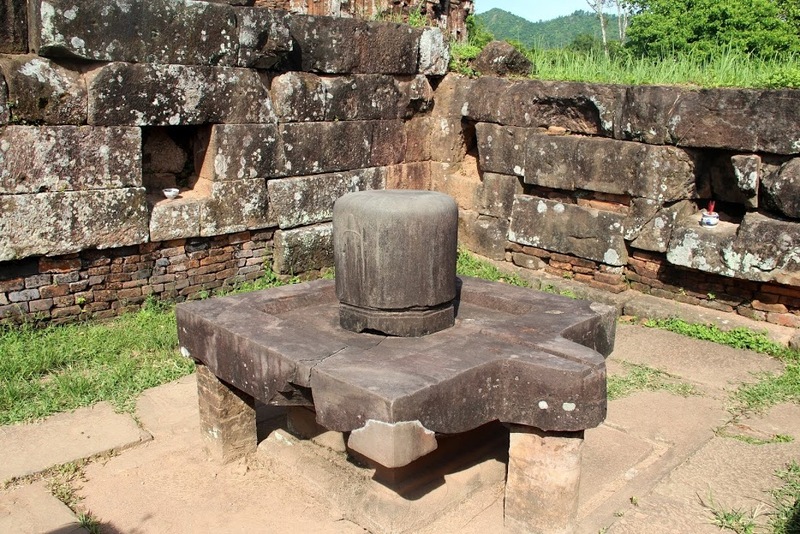 Having seen all the accessible groups, we made our way back, stopping at C to discover a perfectly preserved “linga” and “yoni” set… use your imagination to figure out what they represent. At around 9am, we walked out of the complex, which was starting to get busy, and jumped back in the car. We asked our driver to stop by the museum down the hill, by the ticket office. It was a good idea to check it out for 15 min, and learn more about the cham civilization. My Son definitely doesn’t have the majesty of Cambodia’s Angkor, Myanmar’s Bagan or Indonesia’s Borobudur, but it’s worth a half-day trip if you’re exploring Vietnam on a lose schedule. 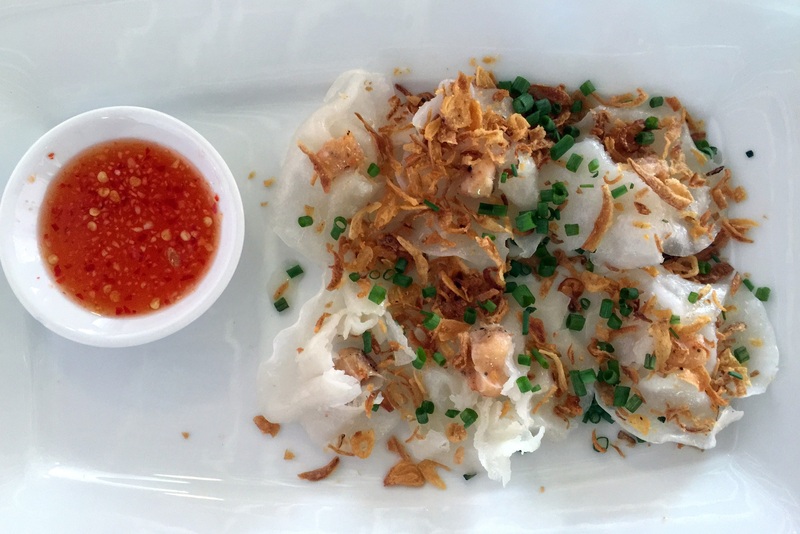 Back in Hoi An, we wanted to try some more food specialties, like white rose (steamed shrimp dumplings). 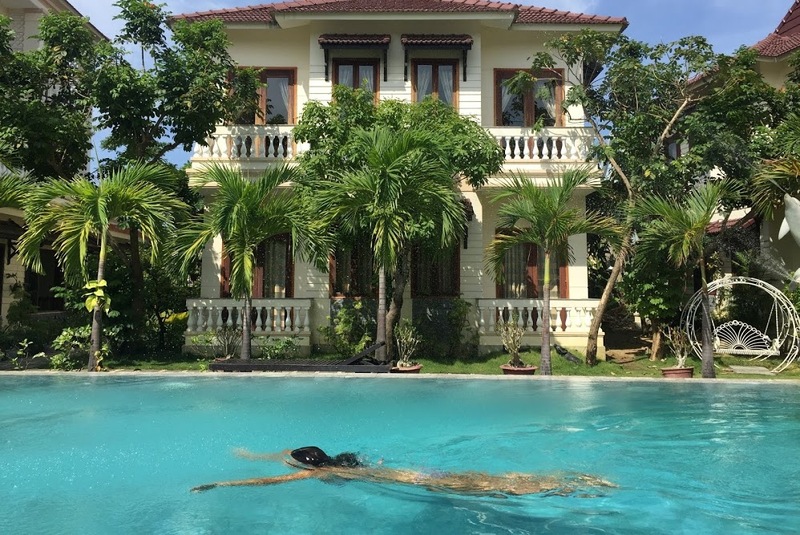 Then we sneaked into the pool near our hotel, and spent the afternoon swimming and relaxing until it was time for our night bus to Nha Trang. Again, I highly recommend asking around a lot and bargain hard, because we met tourists that had paid much more than us for the same ticket (VND 325,000 vs. VND 180,000, or $15 vs. $8). Thank you for the posts on VN. I’m planning a trip in December and stumbled on this website during my research. You’ve mentioned using private cars for some of the day trips – can you share the details of how you found them? Do you have any good contact or do’s and don’ts? 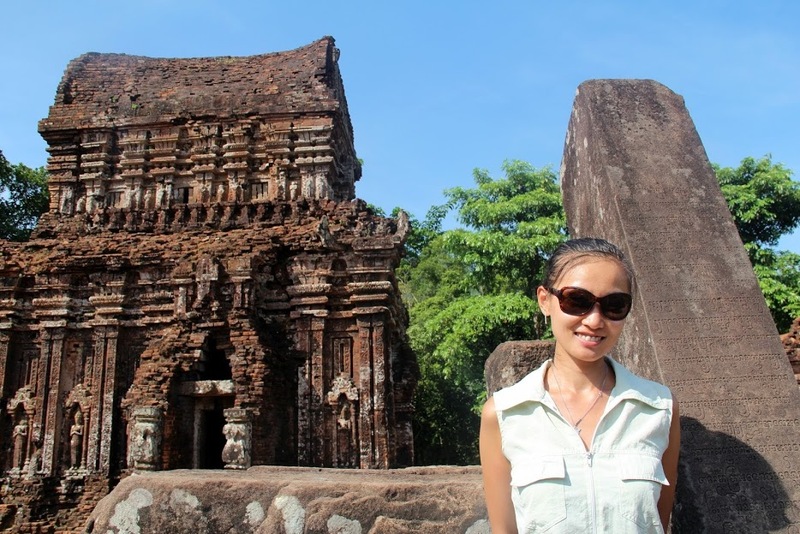 it was quite easy, Vietnam has a very developed tourism industry. We would just walk around the day before, ask in a few hotels and tour agencies, and bargain hard with whoever gave us a low price. The prices tend to be all over the place, and you can get it for much less doing it like this, vs. what I’ve seen agencies ask for booking online. Most of the time, the local owners have a person they can assign to you that does this all the time, so I wouldn’t worry. Would definitely recommend this method (or bikes with drivers, depending on your budget and group size) for Tam Coc, Hue’s tombs, Danang’s marble mountain and My Son.